Buy an iPad Mini battery, high quality original iPad Mini battery. If your iPad Mini is no longer holding the charge as it used to when new, replace your iPad Mini battery with new one. No soldering is required to fit this part as the battery connector is already attached. Please note battery replacement on the iPad Mini is a difficult procedure, we recommend opting for our in house iPad Mini battery replacement service. 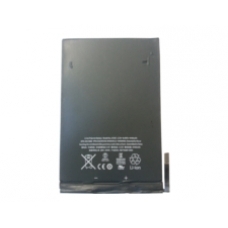 * Original iPad Mini Battery Pack (4490mAh).